The debut of Yamaha’s newest member of their off-road family is as much about a new direction for the company as it is new product. The all-new Wolverine X4 (WX4) represents the first vehicle from Yamaha positioned under a new proven off-road experience brand promise with hopes of delivering real-world capability, comfort, and confidence. 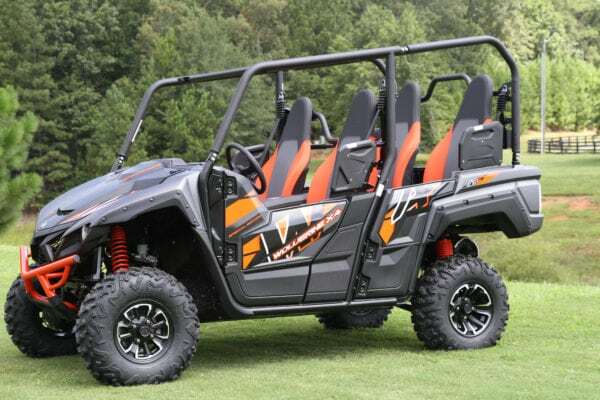 According to Yamaha, the adventure seeking Wolverine X4 has been engineered from the ground up to be the most comfortable, quietest, and nimblest handling of any side-by-side vehicle. The Wolverine X4 truly is new from the ground up. New chassis, new suspension, new engine, and new drivetrain all come together in a design that Yamaha claims is their most comfortable, best handling, and most capable side-by-side ever. To get there the WX4 is built upon a very compact platform, especially for a four-seat vehicle. The wheelbase is just over 52-inches and the width is under 60-inches. 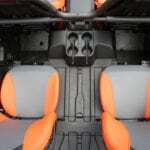 To utilize these dimensions and still accommodate four passengers with equally plush bucket seats, the rear seats are positioned almost directly over the rear axle. The seats are also elevated and positioned atop what is traditionally the rear cargo box. 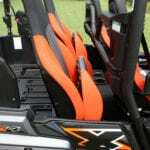 Adding versatility to this arrangement, the seat bottoms can also flip up and the entire seat slides forward to create additional rear cargo box space. According to Yamaha, to achieve their primary goals of confidence and comfort, they rethought the design and positioning of nearly every component of the vehicle. The engine, for example, is new from the case up. 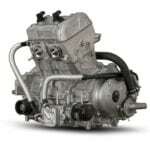 The 847cc parallel-twin, long-stroke motor is very compact, allowing it to be mounted low in the chassis and deliver an overall low center of gravity. The motor and new UItramatic transmission are then mounted near the center of the vehicle, further enhancing the handling of the WX4 by optimizing the weight bias and balance. This top view shows how Yamaha managed to deliver a four-bucket seating arrangement and retain the compact wheelbase dimensions. The rear seats are also elevated, giving passengers an improved riding experience with clear sightlines to what lies ahead. An incredibly tight turning radius, combined with the low center of gravity allows the WX4 to negotiate the tightest of terrain, even with four passengers. Ensuring the new side-by-side can tackle the rugged stuff, it has been outfitted with On Command selectable 2WD/4WD actuation complete with a differential lock. New exclusive 26-inch Maxxis tires tout a new tread pattern, that according to Yamaha, serve up tremendous grip while at the same time eliminating unwanted tread pattern noise. Handling is further enhanced with standard Electronic Power Steering (EPS) that has been tuned for light steering effort, balanced feedback, and is features 12-inches of adjustability at the wheel. Keeping with this light feel approach, a throttle by wire system (YCCT) electronically controls throttle inputs for smooth drive-a-way and acceleration, even in bumpy terrain. Another unique technical attribute of the new WX4 are the self-leveling rear shocks. Tuned for maximum comfort, the new Wolverine can deliver the best of both worlds, comfort and load carrying capability, thanks to the ability of shocks to retain optimum ride height regardless of load. 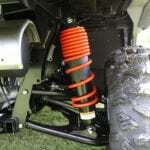 To do so, the exclusive coil over shocks can increase their damping capabilities when the shock senses greater payload and begins to cycle. The rear cargo box opens up to what we would deem a “full-size” box when you collapse and slide forward the rear seats. Thus far, the crew here at ATV World has only received a detailed, one-on-one review of the product and static first look. A full ride evaluation is planned for this fall followed by a full report. While the new 847cc parallel-twin engine features “long-stroke” architecture for improved torque and low-end power, the design remains compact thanks to an offset cylinder to crankshaft design. The seating accommodations for passengers are very plush, complete with more than enough cup holders for ample hydration. The self-leveling rear suspension features auto adjusting shocks which increase damping capabilities based upon payload. While we didn’t get a chance to drive the WX4 (yet), we did get to hear it run and it is amazingly quiet. The vehicle utilizes a new large volume muffler, redesigned air intake, new helical cut gears, bolstered console insulation, and much more all in an effort to make this the quietest side-by-side ever.